Nowaday’s many of the employers recruit candidates through video interviews. Both employers and the candidates get benefit through this video communication. The candidate must be aware of the video interview. All one need to have is a webcam, the employers will provide a link, the participant has to log in the account, carefully read the guidelines and understand the process of facing the video job interview. It is similar to a face to face interview but only difference is to answer the questions online, the candidate will be provided with a certain time limit and they need to finish it within that time. Here are some advantages and disadvantages of the video interview. The main advantage of the video interview is the employer need not have to worry about arranging the venue and manage people. It is a cost effective idea for the company who wants to conduct a quick drive. It saves the time for both recruiter and the applicant, without traveling one can sit and give the interview in a network feasibility area. Also, the answers given by the candidate can be recorded and they can review later for future purpose. It will also help to filter the qualified candidates with accurate results with minimum efforts. It is independent of time bound, an employer in the United States can screen an Indian candidate. It will provide opportunities to the right candidate without any fraud. A candidate can be screened through a video interview. The organizers can send out emails for all the eligible candidates at once and request them to complete the online screening test, where the candidates will answer the questions that are displayed on screen, this will help the recruiters to take number of candidate interviews at once and check out the eligible candidates names that are obtained from the online video test. It also allows the candidates interested to attend other interviews who are already working for an organization and do not have the flexibility to visit the venue and give an interview. In few cases, they also can check their results immediately without waiting for email communication from the HR managers. Many of the job seekers get panic for a face to face interviews, especially it happens with the freshers. A video job interview will help the candidate to answer the question comfortably and get chance to present themselves before recruiters in a better way, it will be helpful for the candidates of a basic nature of how interviews are conducted outside, when they even attend face to face next time they will feel comfortable and improve themselves. This experience is valuable to all the freshers and also for the experienced candidates. As people are more prone to social media and networking, many of them are aware how to use it. Many applicants will apply for the same post across the world. It is hard to pick for the employers the best candidate eligible for the post, this video interview will allow the recruiter to compare and recheck replay the candidates who are close to the job and they can pick the best among them. In a case of a personal interview, one cannot repeat the answers given by the applicant. At a time, many interviews can be taken in different places, the organizers and the candidates need not travel for an interview. The amount of time in screening a candidate will be reduced. Nowadays time is very precious for everyone so something like this will really help to complete their works easily. Employers do observe the communication skills, the body language of the applicant. Similar to the regular personal interview, the interviewers can examine the candidate better and check whether he/she is up to the company standards and will be able to contribute their services to the organization. The same formal interview will be carried with a video interview, so there is no chance of cheating and other illegal activities. The way of dressing, eye contact everything can be captured in a video interview. Though it is a short span of time to observe the candidate skills, it creates recordable observation. They do check the confidence levels towards the job position. Someone who is looking for a part-time or online jobs, this video job interview is perfect to grab it, the organizer will not only understand the skills of applicant but also his or her net savvy skills. To sit and earn money one can apply for the job online and give interview through a video call. It is the latest trend between the job seekers. Also to work for another location one can prove their skills through a video call. Since the timings may vary for someone in another state, they as per their convenience can arrange a call and set up meeting whenever it is possible for both the participants. At times, we may not be sure of the nature of a job so instead of attending an interview in person it is better to have a video call. The HR team can be optimized, since this process does not involve a number of HR recruiters for the screening process, the organizing process will be reduced. If it is a personal interview through video call then the concerned recruiter can take up the call with the candidate. The videos can be forwarded to the other department and can shortlist the candidate for their department if there is no requirement for the current posts. It can be used for training purpose for the new HR team how to handle and manage the interviews. It is the really economical concept for the HR team who struggles to conduct interviews for huge startup recruitment. Candidates need not spend much money to visit the interview place, the organizers also need not travel for the special drives in different locations, the traveling, food, lodging costs of recruiter can be saved, also the employers can perform other activities of the organization once they are done with their task. A proper training about how to process it will give productivity to the organization. One need not repeat the questions to different candidates since the pre-defined set of questions will be displayed to all the candidates with the same content. Sometimes applicants find fake recruiters asking the candidate to attend interview through a video call, it is waste of time, money for the candidate. Unless until it is a trustworthy interview call one cannot find it useful, it may lead to many issues. Also because of technical issues, the job seeker may lose a good opportunity. All may not have the compatible device to do a video interview, hence, they may not turn up to the interview. Due to lack of knowledge about the video calls, they may not be able to convert the opportunity into a job. 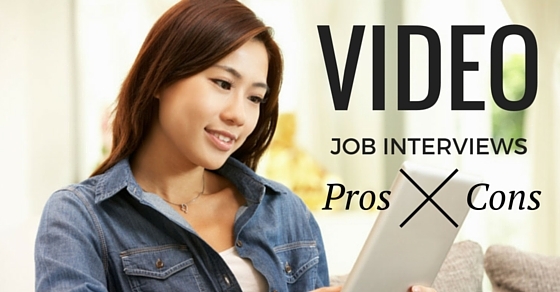 Here are few cases where video job interview is not a better idea. This major disadvantage of video interview is network connectivity issues, if the candidate is situated in a remote location he or she may find difficult to answer the questions and the call may get disconnect, recruiters may not spend time in such cases, even though the candidate has capability and extraordinary skills he will be disqualified. So just because of a technical issue one cannot be rejected, this is the major variation between in-person interview and a video call interview. The applicants will lose confidence with these type of interviews. If there is an application which a candidate is using for a video call and it has a very bad picture quality then the candidate will be banged out from the selection, some jobs may require appeal and presentation, it matters the look, not only the image quality but also because of the environment a dim light may spoil the look of applicant and look dull in the video, a candidate can be rejected due to this reason. It may disturb the conversation with the employer because of the poor quality of the call. If it is personal interview one can be up to their natural way and the chances of rejection will be less compared to the video call interview. The device must support for a video call interview. The candidate needs to answer the question immediately to the recruiter once he is done with his work, if the microphone does not work properly at the time of a call, then the job is gone for a toss, within in less time one has to show up his or her skills. The time one identifies that there is a device problem, the interview will be done and excuses will not be entertained by the employers. So the device or system should be perfect in condition to attend this type of interview. Unless and until there is a good conversation between the participants the process will not be successful. Some interviewers may provide the instructions how to start a call, but in case, it is provided that candidate with bad knowledge in technology will be in a trouble . If they missed any of the equipment required for the calling purpose that interview will be closed. Many of them are not well versed how to operate the webcam and look at other person and start the conversation. It requires awareness and preparation, otherwise, there is no use of option video call interview. For a screening process the candidate will be allotted a limited amount of time, that means the participant should begin the test in the particular slot that was allotted. If there is any delay in logging on to the system or running the websites then the given time will be completed and the candidate may not be able to participate in the test, so one should start early in order to complete it within the time. Spending much time on understanding the options available will consume time and this is the major disadvantage of video call interview, one should be quick enough to understand and operate it. As video call requires a system to operate and mainly it needs a network connection to make a video call, the candidates who do not have facility will face difficulty to attend the call. Broadband connection may be costlier for people who cannot afford it and this type of interviews may cause them trouble to participate in it. A well-equipped system is required to have access to answer the questions and submit their application. Sometimes the telephonic interview and personal interview cost may be less when compared to the new connection. Few companies will try to squeeze money from the candidates by betraying that will provide opportunity to their association and will be asked to pay some nominal fee, it is preferable to check and meet the organization in person and research on it thoroughly before involving it, there are many chances to meet fraud people and organize for the interview. It is better to go for regular hiring practice for few companies and make sure it is right path that is being offered. To conclude as technology is developing there is no harm in using it after having thorough knowledge and analysis about the organization and the process, which will save a lot of time for both employers and employee. To grab opportunities in this competitive world, one should be exposed to such video call interviews to improve and exhibit skills in the broad picture, one who wanted to full fill their dreams can use this facility to cherish their future. Next articleHow Medical Professionals Can Handle Workplace Injuries?